Join Rebecca for a mellow, slow flow class to revitalize body, mind and soul. Accompanied with acoustic guitar by local musician Michael Dooley. Space is limited and pre-registration is recommended. Included with unlimited membership or $17 to drop in. Please note: 20 class, 10 class or 5 class passes may not be used for this special class. 5 times a month yearly members get 10% off. 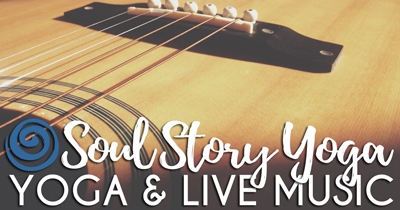 Register at soulstoryyoga.com/workshops, through the MINDBODY app or call Rebecca at 605.660.0067. Please note: All dates and times of workshops and classes are subject to change.